LONDON (CNS) — The threat to religious freedom from Muslim fundamentalists is rapidly becoming a global phenomenon following the military defeat of Islamic State in Iraq and Syria, said a new report. The charity’s “Religious Freedom in the World 2018 Report,” published Nov. 22, noted that conditions for religious minorities in Iraq and Syria have improved so significantly over the past two years that many Christians and other refugees are beginning to return home. “While Islamic fundamentalism has been pushed back in some regions, in others it has expanded,” he said in a video prepared for the Nov. 22 U.K. launch of the report in the House of Lords, London. “The report reveals an upsurge in terrorist attacks in the West, most notably in Europe,” he said. “As the attacks demonstrate, the threat posed by extremists has now become universal, imminent and ever-present,” said Pontifex. This phenomenon of “neighborhood fundamentalism” risked fracturing once-harmonious societies, he said, by creating cultures of suspicion and distrust. Yet many people in the West are blinded to threats to religious liberty by their “religious illiteracy and apathy,” he added. Islamic State fighters overran much of western and northern Iraq in 2014, capturing Mosul and the Christian towns and villages of the Ninevah Plain and forcing hundreds of thousands of people to flee as refugees. A counteroffensive led by Iraqi forces liberated the country from the terror group by December 2017; two months earlier, Islamic State lost control of Raqqa, Syria, which it had declared as its capital. 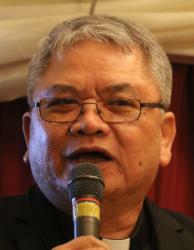 Bishop Edwin de la Pena of Marawi, Philippines, directly linked the demise of Islamic State in Iraq and Syria to attacks by extremists in Mindanao in May 2017. The bishop, speaking at the U.K. launch of the report, said Maute militants affiliated with Islamic State invaded Marawi and persecuted Christians in five months of fighting that ended with their defeat by the Philippine army. He said the group did not succeed because, for more than 40 years, the Catholic minority had cultivated good relations with local Muslims, who vociferously objected when fighters beheaded captured Christians over three days. “There was an outpouring of awareness that we share a common humanity,” he said. The religious freedom report also identified the recent emergence of “aggressive nationalism” as a driving force against religious freedom. Nationalist Hindus in India, atheists in China and Buddhists in Myanmar were responsible for increasing persecution of religious minorities within their countries, it said. It placed Russia and Kyrgyzstan in the “discrimination” category for the first time because of mounting intolerance of religious groups such as Jehovah’s Witnesses. Pontifex said: “Aggressive ultranationalism … means many minority faith groups feel like aliens in their own country. They are easy targets in a new era of ignorance and intolerance. The report examined 196 countries and concluded that 61 percent of the world’s population lives in nations where religious freedom is not respected. Grave violations of religious freedom were found to occur in 38 countries. In 17 of these, serious discrimination on grounds of religious faith prevailed. In the remaining 21 countries, there was outright persecution of religious minorities, in some cases to the point of death, the report said. It estimated that 327 million Christians live in countries where they face religious persecution and 178 million in countries where there is discrimination on religious grounds.